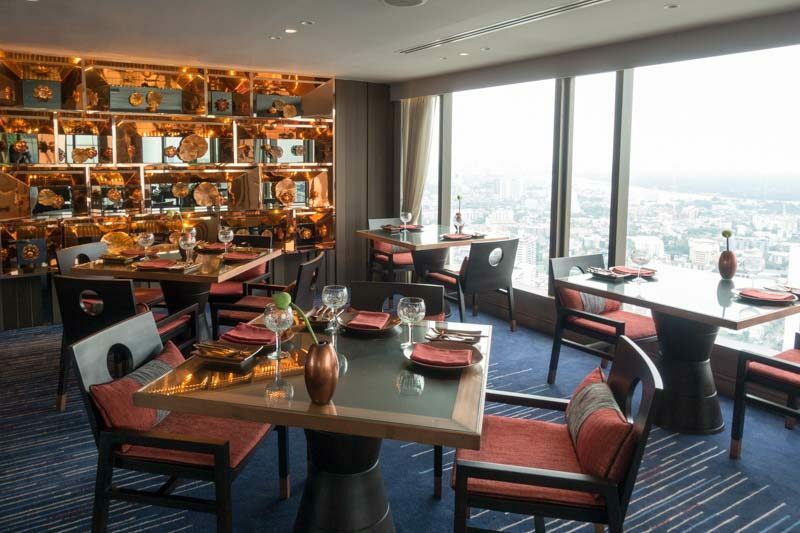 Located 53 stories in the air with a stunning view that looks over Bangkok, Saffron from Banyan Tree Bangkok dishes out authentic Thai cuisine with a modern and contemporary flair. While I expected a meal at this fine dining restaurant to cost a bomb, I was surprised to find out that it had affordable lunch sets that started from THB450. Converting that to local currency, that’s only about S$19 for a four-course meal! 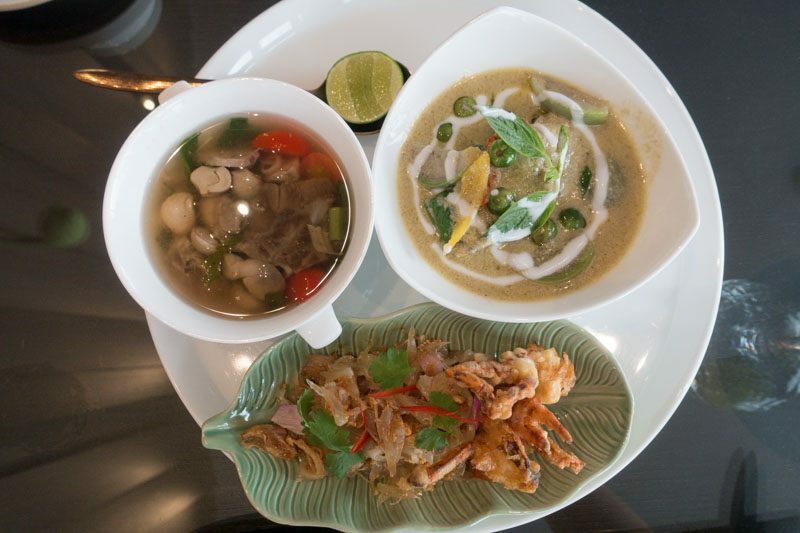 Saffron is located within Banyan Tree Bangkok, a five-star hotel in the Sathorn neighbourhood. While it’s a seven-minute walk from Lumphini MRT, the hotel also offers a free transfer to both MRT or BTS by tuk tuk. The view is certainly something to take in when you’re dining at Saffron. While we were there, the haze wasn’t that bad, so we had a relatively decent view of the city. The restaurant interior itself was sleek and spacious, with lots of golden ornaments lining the shelves and dark teak furniture. Do note that Saffron has a strict smart casual dress code, so no flip flops, shorts, sportswear or open shoes for men are allowed. All four set meals come with a free herbal drink, so the minute we placed our orders, we were served a butterfly pea drink. 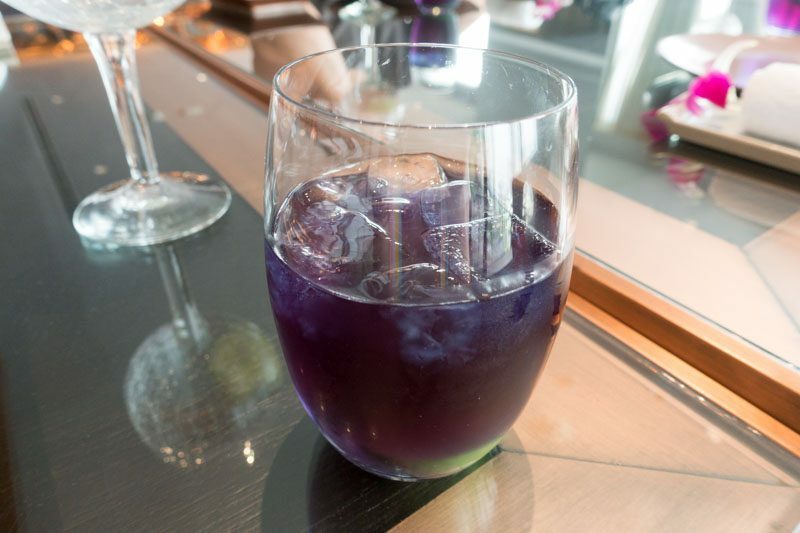 It was pleasantly tropical and sweet thanks to the addition of sweet coconut syrup, and a slice of lime which added a tinge of sharpness and acidity that balanced the drink out. We were also served a crunchy rice cracker snack which came with a chicken green curry dip. Though the rice cracker could’ve been a little more crispy, I really liked the chicken green curry dip. 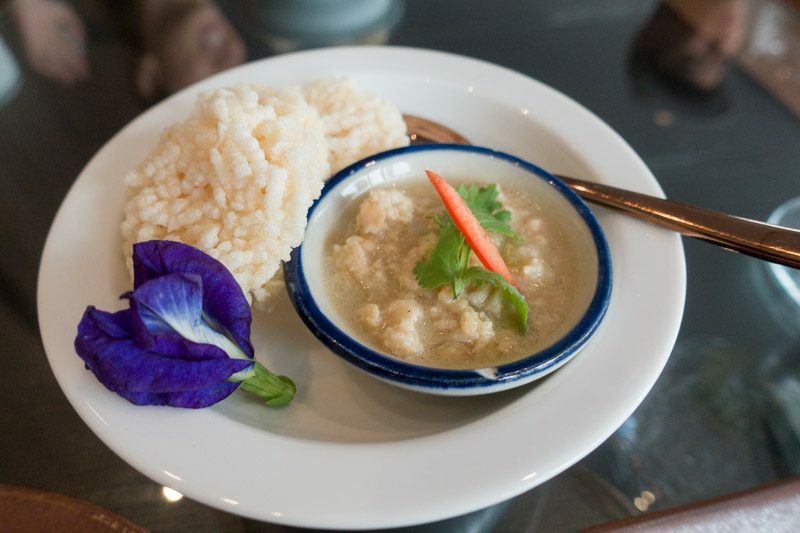 It was fragrant with a strong coconut milk taste, and the minced chicken was firm and juicy. My dining companions and I ordered three out of the four available lunch sets. The one we didn’t get was the Jasmine Vegetarian Set (THB450), which included vegetable spring rolls, traditional mushroom soup, roasted pumpkin curry accompanied with roti, and mango sticky rice with coconut ice cream. The lunch set I ordered was the Lotus Set (THB550). It came with three dishes and a dessert: Yum Som O Puu Nim (pomelo soft shell crab salad), Tom Saab Nua Toon (braised beef shank in hot & spicy soup), Gaeng Kiew Waan Pla (grilled sea bass green curry) and Kluay Tod (banana fritter and Thai tea ice cream). The Yum Som O Puu Nim (pomelo soft shell crab salad) was refreshing and zesty thanks to the pomelo and onion slices and served as a great appetiser. 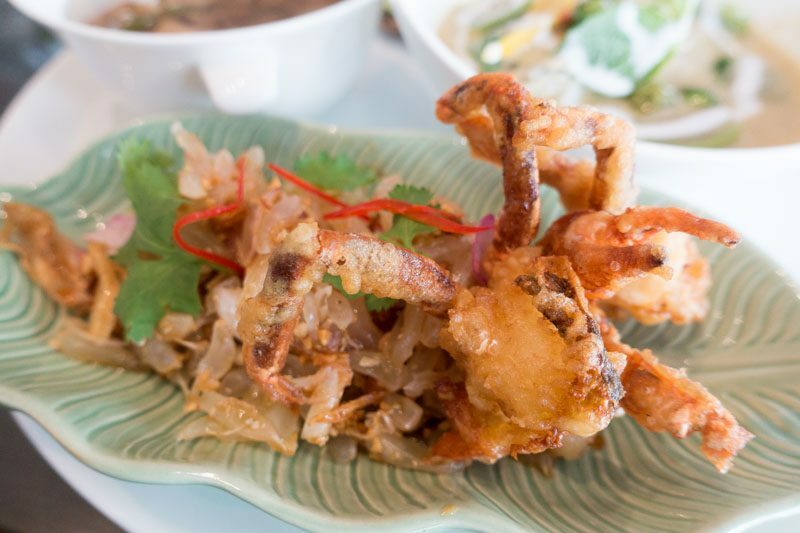 The soft shell crab was delicate and crispy, with a slightly smoky taste because of how it was deep fried. What I really appreciated was the freshness and sweetness of the crab, which was a definite indicator that they used fresh oil. This simple but well-executed appetiser definitely whet my appetite and made me ready for the next dish — thumbs up! The Gaeng Kiew Waan Pla, a grilled sea bass green curry, came with apple eggplants, sweet basil leaves, and was accompanied with salted egg. 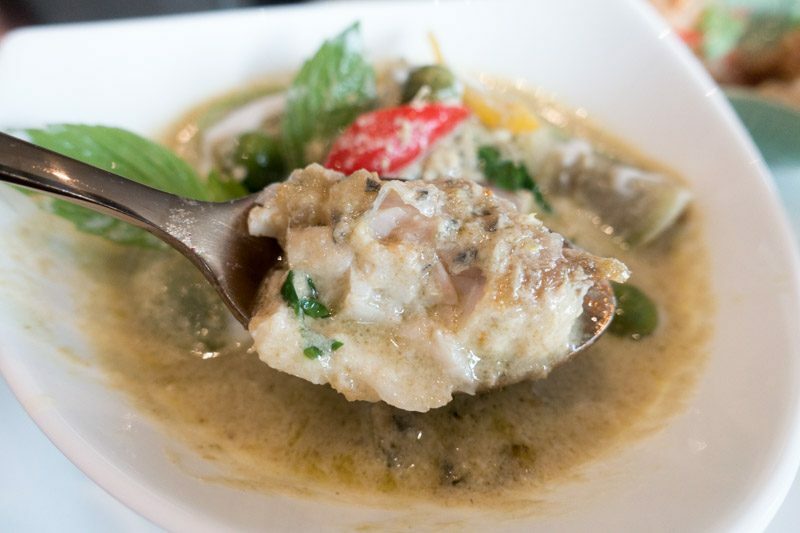 The green curry itself was incredibly fragrant and sweet, with an almost buttery-like texture, but what I really enjoyed about the dish was the grilled sea bass. It was cooked well but still soft, so much so that my spoon cut through the silky smooth fish meat easily. 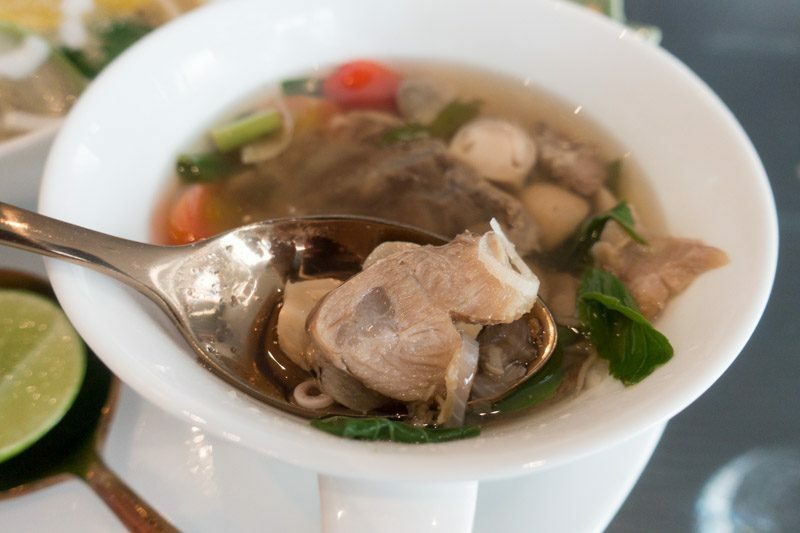 The last dish, Tom Saab Nua Toon (also known as braised beef shank in hot & spicy soup), was delightfully piquant and sour. 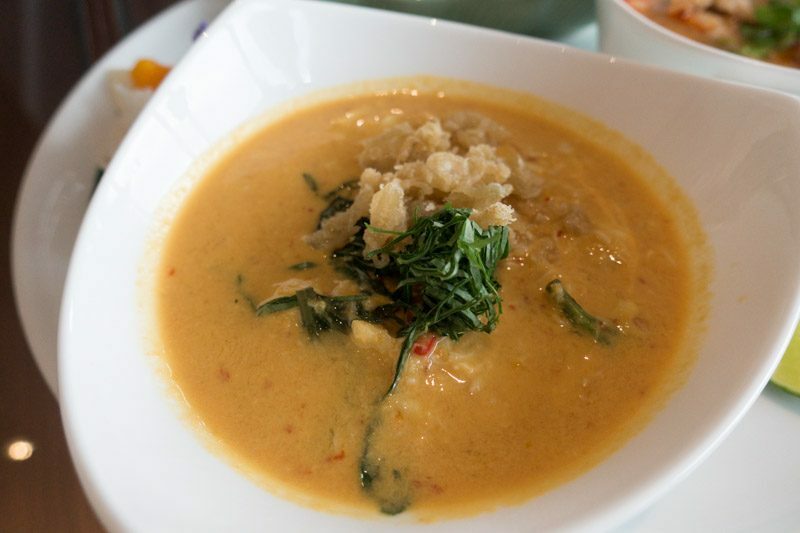 Just like tom yum soup, the soup was tangy and fragrant, with kaffir lime leaves and a strong fish sauce taste. The braised beef shank was fork-tender and soft, though it could’ve been juicier. To some extent, it reminded me of pulled pork that had been left in the slow cooker without enough moisture to keep it tender. 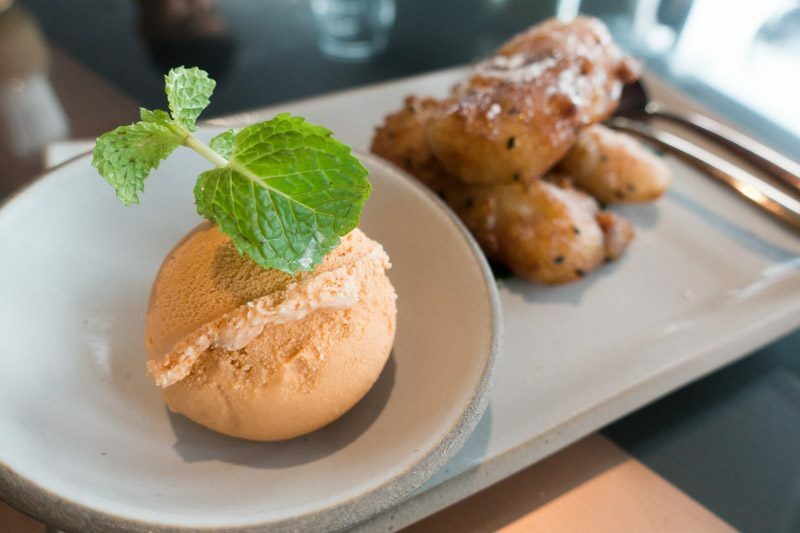 My favourite dish out of this set was definitely the Kluay Tod (banana fritter with Thai tea ice cream). The Thai tea ice cream was definitely homemade; I could taste bits of frozen ice crystals within the ice cream, which is a sign that it had been reworked while out of the freezer and then popped back in the freezer. Taste-wise, it wasn’t too sweet and I could taste the slight bitterness of the brewed Thai red tea. The banana fritters were warm, gooey and sweet, and these small little fried balls of mushy goodness were perfect with the cold Thai tea ice cream. It’s just like having a warm brownie with vanilla ice cream — it’s such a simple dessert, but so satisfying. 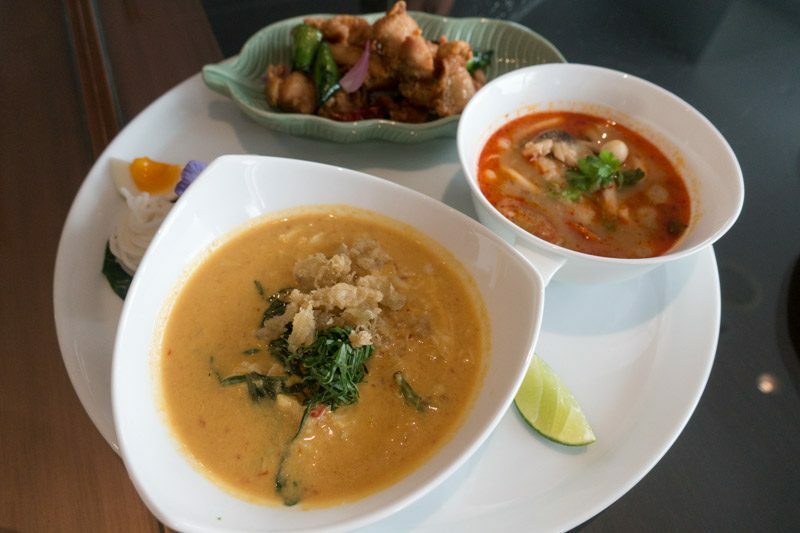 My dining partner ordered the Saffron Set (THB550), which came with Gai Thod Bai Makroot (fried spiced chicken), Tom Yum Goong (traditional spicy prawn soup), Gaeng Kati Puu Gub Bai Cha Plu (red curry with crab meat) and homemade mango ice cream. If I could pick one dish out of this set, it’d definitely be the Gaeng Kati Puu Gub Bai Cha Plu (red curry with crab meat). The curry was more like a gravy than a soup and it had a light milkiness to it that I enjoyed. The betel leaves added a tinge of nutty smokiness to the curry, which made it extra fragrant. Every sip was sour and sharp while the shredded crab meat was sweet and fresh, and this made the dish a complete delight. The last set that we ordered was the Anchan Set (THB550). 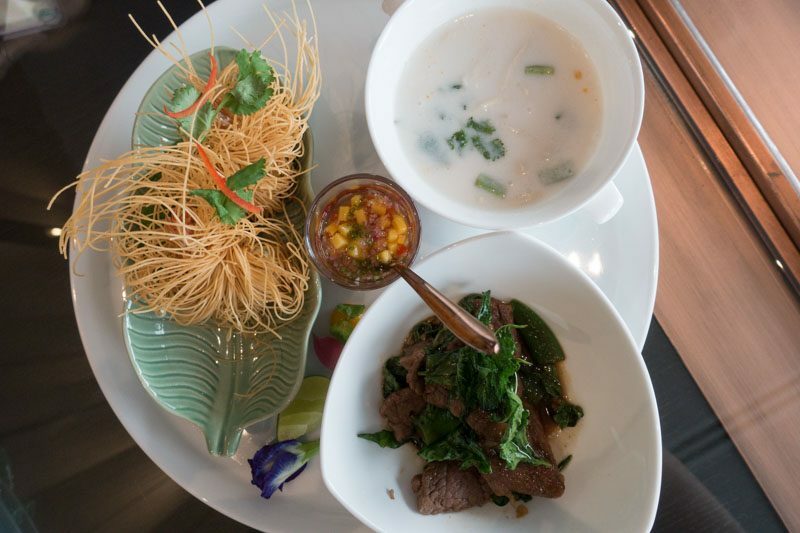 It came with Goong Sarong Buer Tod, which is prawn wrapped in crisp rice noodle, Tom Kha Gai, a galangal-coconut broth, and Phad Krapao Nua, which is wok-fried beef. The Phad Krapao Nua was my personal favourite from this set. While most phad krapao (aka stir-fried beef) dishes use minced beef, Saffron’s rendition of this Thai classic uses sliced beef instead, with a generous serving of hot basil and chilli. 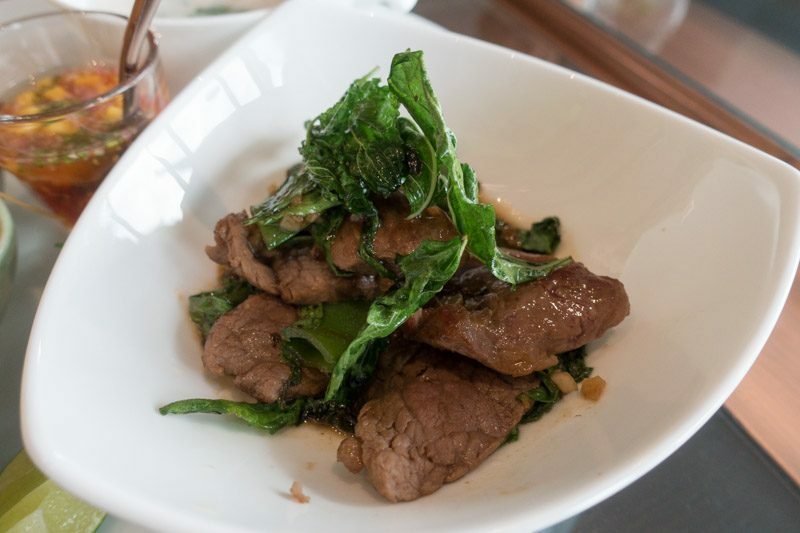 The stir-fried sliced beef was juicy and peppery and the hot basil was fried to a crisp, which I really enjoyed. Though slightly salty because of the soy sauce, this classic dish went incredibly well with my white rice. Dining at Saffron was definitely an impressive experience. Not only did I get to enjoy a breathtaking view of Bangkok city, but the service was also impeccable (no doubt because of Banyan Tree Bangkok’s five-star reputation) and the space of the restaurant was gorgeous and sleek. This place is a great location for business lunches or if you’re looking to have a fancy lunch date. Though the food is a hit or miss depending on what you order, it’s definitely worth the price considering you’re paying for more than just the quality of food when you’re dining at Saffron.